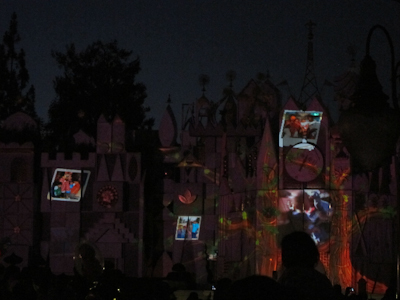 As a part of their year of memories or whatever it’s called, Disneyland created a new nightly show. Disneyland shows never disappoint me, and this one was no exception. In fact, it’s completely stunning. 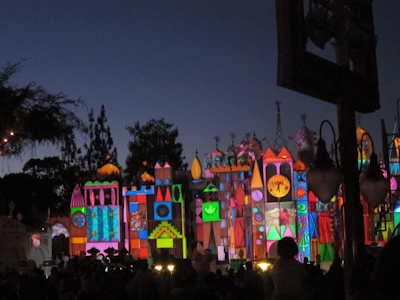 The show is projected on the facade of “it’s a small world,” but unlike the psychedelic frantic Christmas thing they do, it’s actually really amazing. The feature of the show is photos of guests from that day. So you–YOU–could be a part of this show! How many photos, you ask? I’m not kidding. The pictures go by REALLY fast, some much faster than others, and there are lots of them at the same time. Honestly it would be very, very easy to miss yourself in the show. Like “I’ll just look for the cute kid with Goofy!” and realizing that there are 43 cute kids with Goofy and 27 ugly ones in the show. Just kidding about the ugly. Mostly. 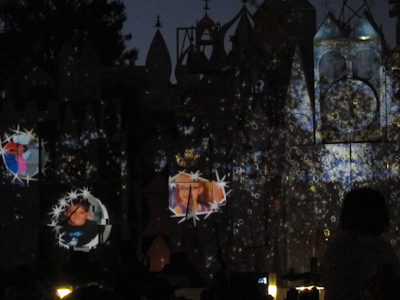 The pictures all come from PhotoPass photographers during the day and get digitally entered in at night. I actually found that out after my photo session, which happened to be on my last visit before summer blockout. But when my pass is working again, am I going to spend the day getting my picture taken by every PhotoPass photographer I can find in an attempt to get in the show? Of course I am. What blog do you think you’re reading? 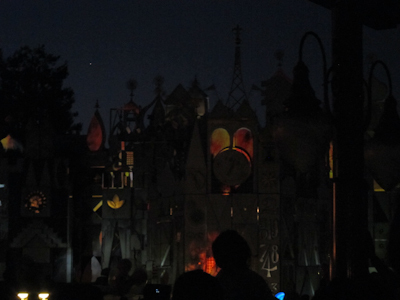 The show starts like every other–the Magic Voice Of Disneyland’s Version Of God comes booming out of the speakers about 15 minutes beforehand telling you that the show will be happening and they’re going to turn down the lights for it so please don’t trip over anyone. 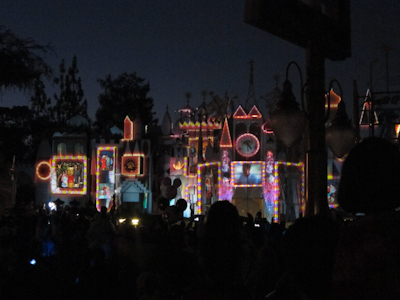 The Voice then provides periodic reminders in a tone just one level below Monster Truck Rallies, and then finally the lights do go down and Small World turns white, which is really weird because it never looks like that. 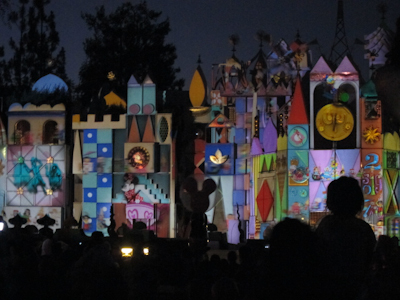 Oh em gee, what happened to Small World? It can be tough to find a place to stand. I ended up precariously balanced on the edge of that platform thingie (technical term) sort-of by the churro cart but farther down, but on that side. Then I used my zoom lens a lot. The disadvantage of my position was a pole in front of me, which will be painfully obvious in all of the photos in this post. Sorry. 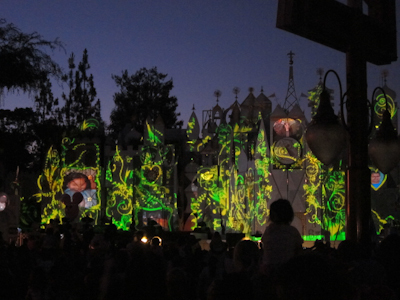 The show is technically a projection show, but it’s an animated projection. First a bunch of vines grow up from the ground. At various stages, people’s pictures start appearing. Now honestly, it would really be impossible to try to look at all the pictures to see if one is you, since the facade is pretty big. My advice is that if you know you’re in the show, get there early, get an elevated spot, and video the whole thing. Am I going to be doing that? Oh wait, maybe it’s bubbles. Kind of looks like bubbles. My memory is so bad. Anyway, two things are definitely true: One, at one point Tinkerbell DOES come out and spread some pixie dust around, and Two, I didn’t get a picture of it. 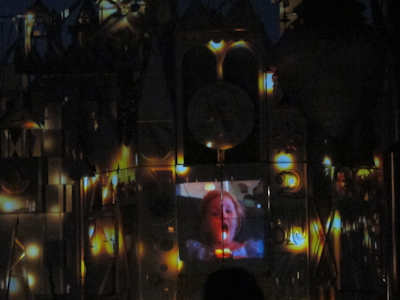 The Dumbo comes out, and Small World really manages to look not-Small-Worldey. And sometimes when the effects focus more on Small World itself. There are lots of different ways to present the pictures, like in clouds, for example. 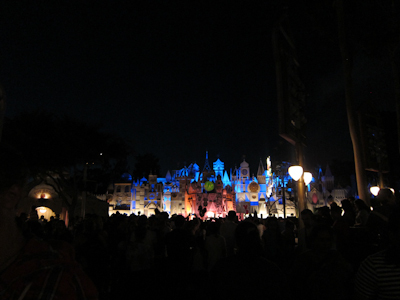 Many of the scenes depicts Disneyland rides. Some of them more than one. And then one of my most favorite women in the entire universe, Julie Andrews, comes out to sing. 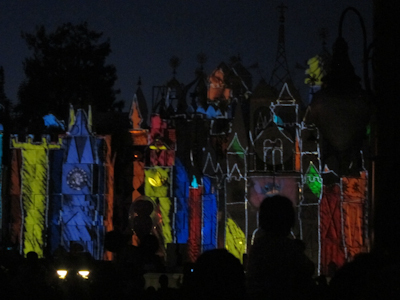 This one was one of my favorites–the effect features what looks like scaffolding and Goofy and his friends start building. There’s a great Pirates of the Caribbean scene. This next one was my most favorite of all. 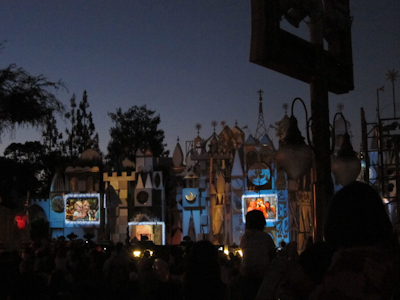 They make Small World look like the castle. And seriously, it looks so real I had to go back later and see if the shape of Small World is actually the same as the castle or if it was just that good. 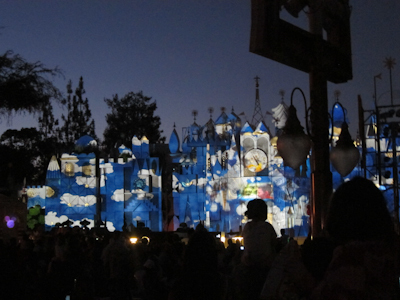 Another cool effect was when they “drew” Small World and then “colored it in.” I’m using the quotation marks appropriately here. Then there was more growing things. I think these are rose vines and are supposed to represent Sleeping Beauty, but don’t quote me on that. And don’t “quote” me on that either. 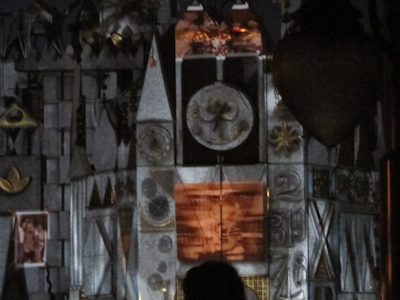 Then the facade got white again and we got several old, sepia-toned pictures and videos. 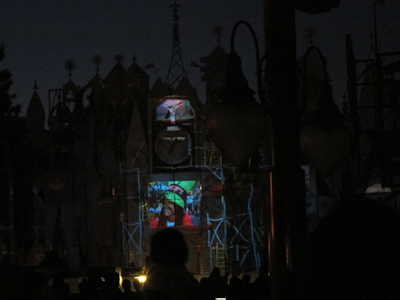 These aren’t actually from that day, but are boilerplate from pictures people submitted over the internet when Disneyland was looking for pictures like this last year to put in this show. It was blow out the candles time, again with a guest-submitted video prior to the show. "My wish is...to go to Knott's Berry Farm!" Then the pictures totally started flying. There were integrated pictures throughout the show, but this last part (we’re near the end, btw), they just started throwing them out there like a rapid-fire machine gun. 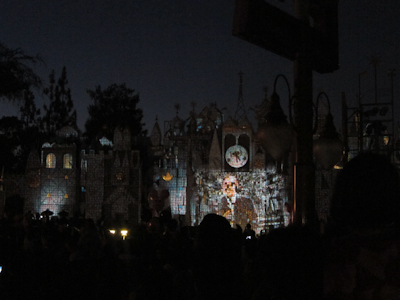 Then they made Walt out of pictures. 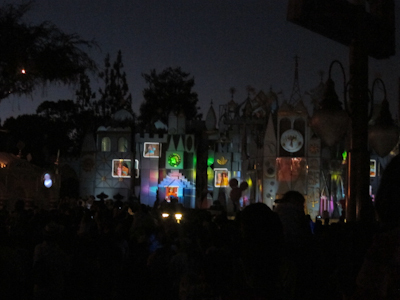 Then there were several more pictures, and the whole facade lit up. And just like that, the show is over. 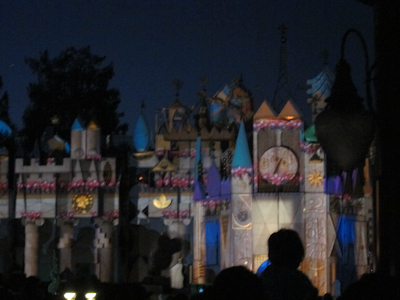 The lights come on, and Small World turns back into Small World again. 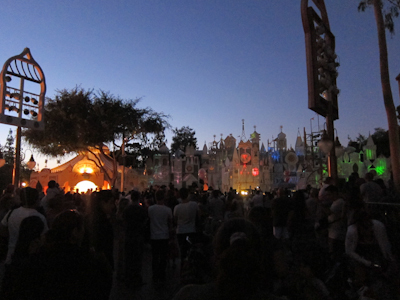 And then depending on the schedule, it becomes the world’s biggest bottleneck as the fireworks come on a short while afterwards and everyone needs to either stay on the side of Small World or get on the other side of Fantasyland because the main part of Fantasyland closes for the fireworks. We headed over to Autopia, where we got to see the fireworks from the ride itself. That was pretty cool. Expect another post on this one once I get myself into the show, ladies and gentlemice. Count on it ;). We were there that day. But in our 5 day trip, we didn’t see the Magic, The Memories, and You show. 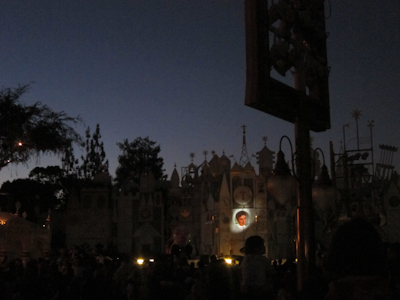 We opted for Fantasmic and WOC instead. It would have been cute to see our DD hugging Pooh up on the SW building, but the shows are so difficult to see because of the crowds. As much as people complain about WOC, I kind of like how you KNOW you have a spot because you have your ticket for it. 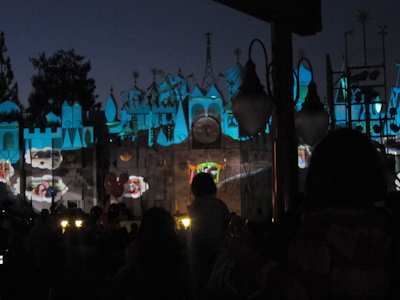 We actually had a great view for WOC because we went to the second show. Right in the middle and down front. I love WOC but I think the viewing area is very poorly designed because it’s not tiered enough and if you’re short, it’s hard to get a good spot. Just because you have a spot, doesn’t mean it’s a good one. We did the dinner at Ariel’s Grotto plus WOC tickets and the “priority” viewing there was rotten and I had to stand on my tip toes the whole time. I personally think Fantasmic is overrated and for at least a decade it had no seating either, except whatever you could stake out. I know MMY has no viewing, but as a temporary show I’m not surprised. They’d have to block or impede the walkway for it. The only other option for MMY would be to project it on the castle like they do at WDW, but that would involve closing the castle, and that has no viewing area either. Amber, we went to WOC and were in the front row near the middle as well and it was GREAT!